The saying „nature abhors a vacuum“ is sometimes reassuring, even if I’m not entirely sure I believe it, in explaining some of our ongoing household conflicts to me. I try to remind myself of it whenever I get frustrated because every time I manage to clear some space in my household, someone else comes along and put something there. Over the past twenty years or so, I have mostly resigned myself to living with a lack of cleared spaces. Sometimes, however, I still feel compelled to resist. When I came home Friday evening after a very long week of marathon translating, I was surprised to find that Paddy, contrary to the plans we had made in the morning for watching old films together, was not at home. In fact, no one was at home. Faced with this unusual situation, I cleared enough space for myself to curl up on the couch with tea to read the novel that Christopher had given me for Christmas (along with a lecture that I should read novels sometimes). 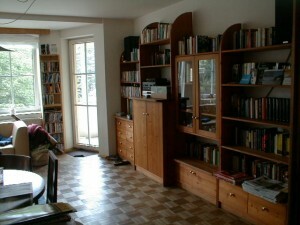 That was so enjoyable that after Paddy left early Saturday morning to spend the weekend in Munich, I decided that it was time to tackle the issue of space in the living room again – starting with the bookshelves. Sometimes I have rather mixed feelings about the use of space in our household. A few years after we first moved in here, the young couple across the landing from us, whose two children were born shortly after Paddy, the first child born in this house, moved to a bigger place more on the outskirts of Linz. Unfortunately, they didn’t tell us at the time that they were selling their flat. At that point, it would have made sense to take out a second loan to buy their flat to expand our own. By the time the flat was for sale again, that no longer made sense, as it would have meant repaying a second loan long after the boys would presumably have left home and Peter and I would no longer need that much space. That means that since Paddy was born when Christopher was 20 months old, the boys have always shared a room. A small room. Actually a very small room. Although they are now nearly grown young men (Christopher is taller than Peter and has relatively broad shoulders on the rare occasions when he stands up straight, Paddy is quickly catching up), they still have bunk beds, because there is not enough room for two beds in the room they share. It is obviously and understandably not possible for them to spend a great length of time in that room together, even though I have often been surprised by the number of people that can be squeezed into that room for recording sessions and can even sleep in there sometimes. The living room has always been the most comfortable and appealing room, a shared space where everyone gathers. Despite the conventional insight that as a middle class family we ought to be able to provide separate private spaces for each of our sons, as an old feminist I have always thought that it is important for my sons to have a better understanding of shared space, shared responsibility for shared space, and a sense of how much space they may reasonably occupy. I’m not always sure how well that has worked out. For years Paddy was almost permanently ensconced in the computer room (yes, the computers need a whole room of their own, but they share it with guests whenever needed), but after he got his own laptop, he moved almost permanently into the living room. Although Paddy never developed the irritating habit of physical occupying an inordinate amount of space as Christopher, like most teenage boys, did, at some point he started occupying more and more space in the living room by spreading out his belongings, something like marking territory. It is, of course, an exquisite luxury to have my favorite singer available to play private concerts on request at almost any time. Nevertheless, something is somehow not quite right. As Christopher is now working long hours at the exhibition „Höhenrausch – Thrill of the Heights“, Paddy is the only person in our permanent household not working long hours (apart from studying occasionally, I think), but seems to take the least responsibility for our shared space. If specifically and explicitly requested to do so, he sometimes takes over a few chores, although he frequently forgets when it is his turn to do the kitchen. His primary contribution seems to be to provide a motivating „soundtrack“ for other people to do chores. As enjoyable as that is, it still doesn’t change the fact that the living room has become primarily his space, which I am not entirely happy with, although I do understand that he needs space. Apart from Paddy’s laptop, various and sundry gadgets, sketches and books, he also has an almost alarmingly proliferating film collection, so there are DVDs everywhere. EVERYWHERE. In addition to that, there are books piling up all over the place, newspapers and magazines multiplying and spreading like a contagious disease, and stacks and stacks of CDs. In fact, I’m not quite sure why there are stacks of CDs everywhere, because everyone except me has an iPod and therefore doesn’t really need CDs. I think. I know they are not my CDs, because I try to keep mine separate and contained (which unfortunately doesn’t always work, because I am still searching for my „Silly Wizard“ CD that isn’t in its box). With Paddy in Munich and Christopher at work (Peter went to hide in the bedroom with a book), I started cleaning: sorting, dusting, ordering, rearranging, putting things away into various places I could find to contain them. For many years Peter and I kept our books together in a very strict alphabetical arrangement, but that has been breaking down for some time now. I do need to know exactly where my Bronte sisters, George Eliot and Doris Lessing books are (I keep my books on feminism, art, philosophy, etc. in the office once they leave my night table), but I have reached the point where I am just happy to have the rest of the books inserted in the book shelves at all now, even sometimes in double rows, rather than stacked haphazardly every which way. Although I found myself missing my favorite singer as I worked, a Joni Mitchell CD that I found along the way provided a suitably sentimental soundtrack for working my way through some twenty years of books that Peter and I have acquired together. I was most relieved to discover that not only is our collection of Douglas Adams books still complete, but even „Mind That, ‚Tis My Brother“ and „Turtles All The Way Down“ were in fact kindly returned to us by the last person we lent them to, they just didn’t go back into the bookshelf, but onto an eclectic pile instead. By about eleven in the evening, I was surprised myself how different the room looked. Christopher told me that when he came in about one with his friend Alex, at first he couldn’t figure out what was wrong. Now I’m worried that when Paddy comes home tonight, he will feel that he has been displaced (Christopher cheerfully assured me that his brother will probably not be happy about the change). Nevertheless, I am happy to have been able to clear some space. I’m sure it won’t be long before it is filled again, but that’s all right too. I’m curious to see how it will be filled now that there is room to start over again.